Weddings used to be a one-day affair for couples to share their love and affection with their close friends and family. These days, weddings comprise a $51 billion dollar industry touting a year-long commitment from close friends and family that includes the engagement party, bachelor and bachelorette party, bridal shower, and the wedding itself. If you have the privilege (or curse, depending on how you look at it) to be chosen as a member of the bridal party, you should be ready to shell out big bucks for everything that comes along with the honor. Gifts, trips, and outings can quickly add up and make your bank account beg for mercy. Bachelorette parties are one of the many wedding intricacies that have turned from a one-night affair into a days-long, sometimes week-long time commitment, which can be expensive. What used to be a fun night out on the town among friends has now turned into girlfriend getaways to Vegas, Hawaii, the Bahamas or other locales far away from the bride’s hometown. If you’ve recently been tasked as the maid of honor or bridesmaid and are trying to plan a bachelorette party that won’t leave your wallet screaming for mercy, follow these tips to enjoy a fun and affordable bachelorette party. It may not sound glamorous, but chances are between all the chosen bridesmaids, someone knows someone who knows someone that has a house they can borrow for a weekend. It could be in the mountains or near a big city – all you need is a houseful of girls for a fun weekend getaway at low cost. Use six degrees of separation to figure out where you can book your free house within driving distance, and you’ve already eliminated two major expenses: hotel and airfare. If you really don’t live anywhere close enough to drive, plan a staycation, but make it themed. Have everyone bring their favorite spa-like treatments (maybe one girl can be in charge of manis, another pedis, one facials, etc. ), and bring some games to play that will leave you in stitches, such as Cards Against Humanity (you can download it for free!). Give each other makeovers and pretend you’re in your teens again. It’s always okay to stick to just one night of debauchery rather than a whole weekend or week-long affair. With one evening, you can choose to do a nice dinner, followed up with drinks at some local bars. If you’re planning a weekend getaway with some girls, have everyone be in charge of a meal to limit your outings and expenses. Let someone plan breakfast, another lunch, and stick to just dinners out so you don’t have to overspend on food. Besides hotel and airfare, food and alcohol can be your biggest expenses. Let’s face it—alcohol at bars can get expensive real quick and is marked up heavily. Have a contest to create the best mixed drink at your house. Each girl plays bartender and should create a drink they think the bride will love. The drink with most votes wins! Just because someone is getting married doesn’t mean you have to go broke. Plead with your bride and fellow bridesmaids to try a nontraditional and budget-friendly approach to the expensive bachelorette festivities. 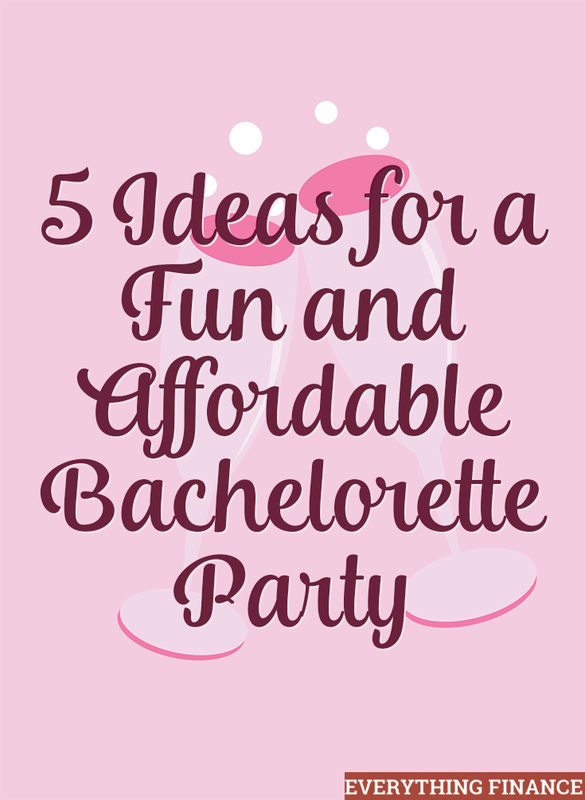 What simple, fun, and affordable bachelorette parties have you been to or planned? Any other inexpensive ideas for a fun night?